Members of the 12 families included in the Order Carnivora inhabit a wide variety of habitats across all of the continents and most of the seas of the world. Carnivorans show an enormous diversity of diets, hunting strategies and social structures. They are relatively intelligent mammals. To catch and kill other animals, they must be well co-ordinated and remain one step ahead of their prey. The ancestral feature, which indicates that all these mammals evolved from a common lineage, that expanded 50 million years ago (mya), are their highly modified fourth upper premolar and first lower molar teeth which are adapted to shear flesh. These four teeth, called carnassial teeth, have knife-like edges so that the teeth slice past one another and act like scissors when the jaw is closing. 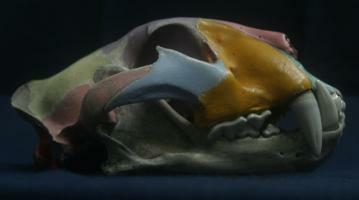 The restricted vertical movement of the jaw, another feature common to all carnivorans, helps the carnassial teeth to function. 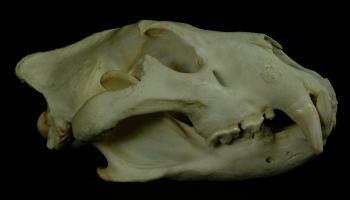 Wolf skull shows well-developed canines and carnassial teeth. The basic dental formula of carnivores is I (incisor) 3/3, C (canine) 1 /1, PM (pre-molar) 4/4, M (molar) 3/3 = 44 with well-developed canines. Adaptations to diverse diets have led to many variations on the basic dental formula with most carnivorans having less than 44 teeth due to a reduced number of premolars and molars. 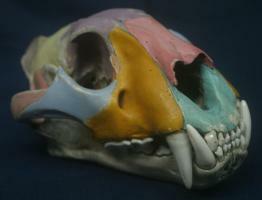 Many modern carnivorans, e.g lions, eat meat from other vertebrates or invertebrates and have well-developed carnassial teeth. 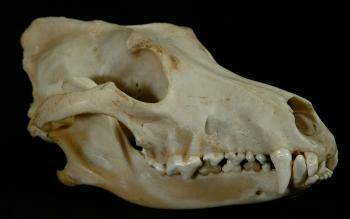 In others, the carnassial teeth have become adapted to a herbivorous or to an omnivorous, mixed diet of meat and vegetable. 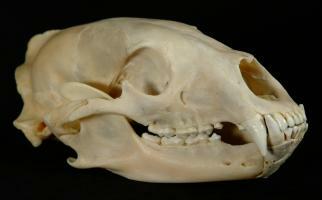 The premolars and molars of modern bears are modified to grind vegetable matter. Some few species have adapted to very specialised diets: pandas feed on bamboo, aardwolves on termites, walruses on molluscs and crab-eating seals on krill. Generally speaking, diet has determined size limits in carnivorans. 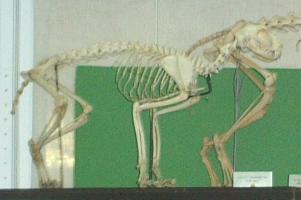 Meat-eaters, such as lions, and omnivores, such as bears, can become very large. Aquatic seals and sea-lions become very large on a diet of fish; walruses become enormous on a diet of molluscs. Insect-eaters are restricted in size due to the problem of acquiring large numbers of such small prey and with one exception only reach a maximum of 20 to 25 kg. The exception is the sloth bear that feeds on termites, which it can obtain in large numbers. Other adaptive characteristics of Carnivorans relate strongly to how they obtain their food and their diets. Features common to the more carnivorous terrestrial members, which are close to common ancestors, include modifications of the skeleton and limbs that help in catching prey by fast pursuit and of the skull and dentition that aid in processing meat. 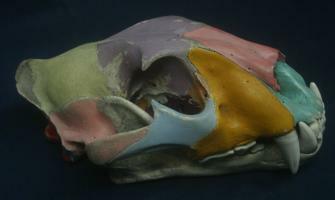 The skull is made up of: the parietal bone (yellow); the frontal bone (purple); the nasal bone (dark pink); the premaxilla bone (turquoise); two maxilla bones, one on either side of the skull (orange); two zygomatic arches, one on either side of the skull, made up of the jugal bone (lilac) and a process from the squamosal bone (light pink). The jaw is made up of a single bone: the dentary or mandible (unpainted). Prominent zygomatic arches on the skull for attachment of powerful jaw muscles, i.e. the masseter and greatly enlarged temporalis muscles. A recent consensus is that the following assemblages of mammals evolved as a carnivoran lineage diverging from a common ancestor some 50 mya. Modern families appear to have evolved as two main branches. For convenience some taxonomists adhere to a classification in which terrestrial families are assigned to one sub-order Fissipedia and the aquatic families are assigned to the suborder Pinneipedia. Here we describe each family separately and illustrate the pages with some of our skeletal material. 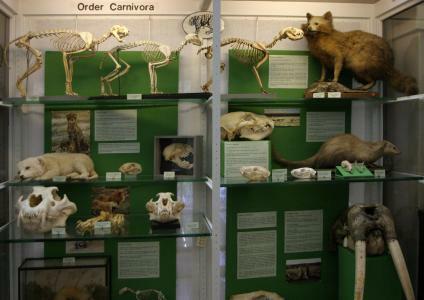 We have skeletal material from all families and some stuffed specimens of smaller animals.